There has been a lot of debate the last week as to how much the loss to Michigan hurts. Under ordinary circumstances, nobody on either side of the greatest rivalry in sports would want to lose the contest called “The Game.” As the seconds ticked off of the scUM’s first win in seven years over Ohio State, I had an odd feeling in the pit of my stomach. It was a feeling I have not experienced after losing to the state up north. It was pride. Some say there is no pride to be had in losing, but this was a gutsy performance by the Buckeyes. It was clear the defense needs help. It was evident that Braxton Miller needs to work on his accuracy with the deep ball. The one thing that was most apparent was the Buckeyes have heart too. For 60 minutes in Ann Arbor, Ohio State went toe to toe with one of the more prolific offense the scarlet and gray saw all season long. Then it was just 48 hours that a Buckeye Christmas came early. Now that we are all in the holiday spirit, let’s talk some season ending issues in the latest Scarlet and Gray Q&A. Every season, anyone, who has any kind of writing commitment, will tell you at some point you hit a wall during a given season. It is up to every scribe to find what exactly it is that keeps him or her going, but for me, I usually draw my inspiration from on the field performances. I have gone from frustrated to empathetic when it comes to the 2011 season. There is no question that 2011 has been a tough me for on many different levels. I am not an apologist, but I am a good friend to a man who lost his job that he loved. Compounding all of this was taking on a career that requires me to explain what happened and why things transpired the way that they did. To top everything off, I have had to endure one of the more trying seasons on the football field that we have seen in some time. With that being said, every season can be salvaged with a win over TSUN this weekend. So, let’s get after a little Scarlet and Gray Q&A. Ohio State has gotten off to slow starts in consecutive weeks. What is main cause of this uninspired play? I have to be honest. I never was in the locker room for a pregame speech from the Vest. I have heard they are legendary for the most part, but most of the time I was out on the field before the game kicked off. I know that “getting up” for a big game isn’t based in just an inspirational pregame speech, but the message, whatever that may be, has gone stale. It appears that for the most part Fickell likes to lean towards tapping into the team’s emotions. But there was a columnist, who covers Ohio State, that pondered how often Fickell could tap that well before it would run dry. I am in agreement that a player’s reaction diminishes to the same stimuli, and I feel like Fickell just doesn’t have a whole lot else in his arsenal. That is not all on him, because I think this is a learned skill for a head coach. If I asked you to go out and inspire the team to play the scUM on Saturday, we would all tap into the emotional side of things. It is just the way most people would do it. The problem is this is only effective for so long, especially when it is the same voice saying the same thing repeatedly. I place some blame on the leadership on this team. We all love this group of seniors for what they have had to endure and have done so with class. It just seems like after Wisconsin, the upperclassmen were spent. Younger players feed off of the message from their elder counterparts, and I haven’t seen a whole lot of that lately, which leads me to my next question. Fans are a fickle bunch. No pun intended, but there really is no way to tell from week to week what exactly the mood of Buckeye Nation. We are a moody bunch to say the least. I, for one, am normally an optimist. 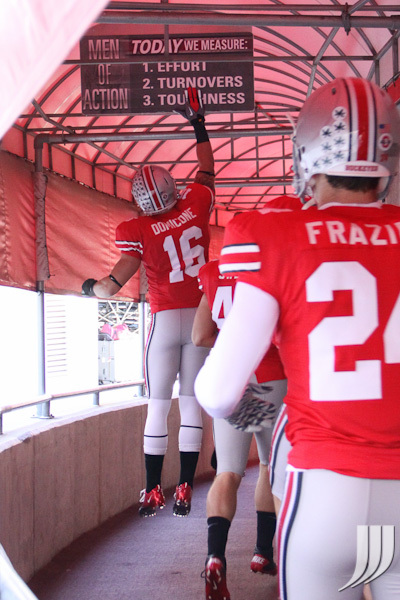 Five seasons inside the bubble that is the Ohio State football program tends to give you a realistic view on life. In the words of a great coach “You can’t ever get too high, and you can’t ever get too low.” The message is one to try and live your life by, but there may be no better week to remember this quote. With that, let’s get to a little Scarlet and Gray Q&A. Should we be worried after Ohio State’s 34-20 victory over Indiana? The weekly therapy session that we go through as Buckeye fans is always interesting. I would be lying if I didn’t do the same thing. That certainly didn’t look like a 1-7 Indiana team that played in the ‘Shoe on Saturday. But it is hard to forget that it still was a team that has only beat South Carolina State this season. With all that being said, Tre Roberson is going to be someone special in the B1G over the next few seasons. He reminds me of Antwaan Randle El, and we all can remember how good he was under center for the Hoosiers. The biggest concern continues to be the play of the Buckeye secondary. It just seemed like they were out of position a lot the past few weeks. I am sure Jim Heacock, Taver Johnson, and Paul Haynes have been working overtime to try and figure out what it is that is ailing this unit of pass defenders. It speaks volumes that a guy who is a redshirt freshman has developed into the team’s best cover corner. Bradley Roby has had the honor of guarding some pretty good B1G receivers over the last few weeks. When you consider the gauntlet of AJ Jenkins, Nick Toon, and Kofi Hughes, it is pretty clear that Roby has established himself as the best corner on this team. Every player has that defining moment in their career. It is that moment where a player seizes the moment and changes the course of a game, a season, or even a career. Whether it was Joe Germaine’s last minute drive in the Rose Bowl, Eddie George against Notre Dame in the ‘Shoe, or Troy Smith against Michigan in 2004, Buckeye fans have plenty of defining moments to tie heroes of yesterday to that first time greatness was observed. 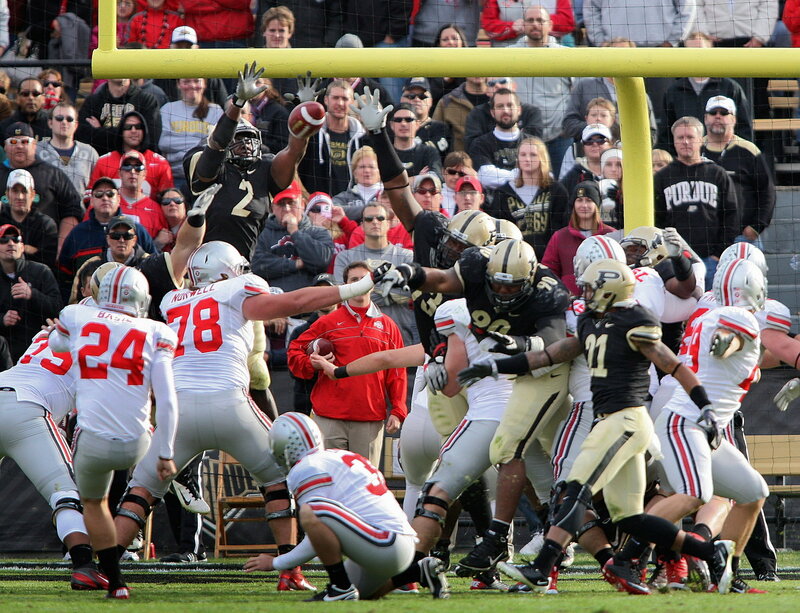 It doesn’t matter how many times I watch the play, I am still amazed by the touchdown pass that might have salvaged 2011 for the Ohio State Buckeyes. In an era when freshman are counted on more and more, it was two in Braxton Miller to Devin Smith, that created a moment fans and pundits will talk about for years to come. It may have been the uniforms, the night game, or Homecoming festivities, but whatever it was, the Buckeyes have changed the landscape in the B1G. With that let’s get to Scarlet and Gray Q&A. 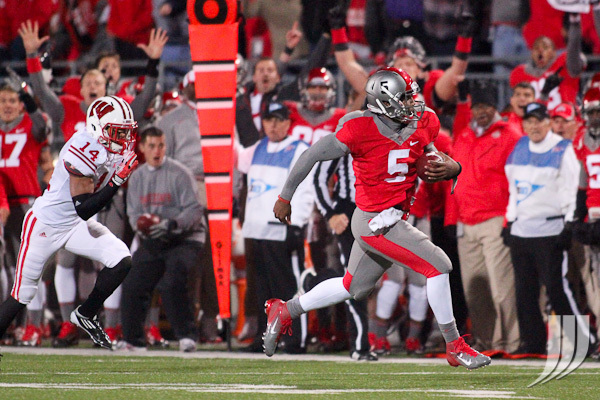 Does Braxton Miller’s performance against the Badgers mean that he has arrived? It is clear that the bye week may have had no greater impact on anyone other than Braxton Miller. The confidence that was evident from the true freshman was obvious just a few plays into the ball game. Sure, Miller’s pass intended for Corey Brown went as a long incompletion, but it was obvious that the pass was an indication that the reservations, present just a few weeks ago, may be a thing of the past. I know Braxton didn’t throw 35-40 passes. He didn’t even throw 15, but it was clear that each week, the coaching staff trusts the young quarterback a bit more. The pass to Devin Smith provides a glimpse into the playmaking ability of possibly the next quarterback in college football. A friend remarked to me that a freshman doesn’t make that throw. The play is something that transcends years, film study, and playbooks. It is an ability that can’t be taught. Being a playmaker is an art form that is so organic in a career that coaches know just one thing about: when you see a playmaker, you play him.